The Ebola spread is one of the most devastating diseases West Africa has known so far, more than 15,000 people are infected and 5000+ have died, organisations are now setting up mobile donation services to help fight the spread. The Ebola outbreak started in Sierra Leone, Guinea and Liberia and later found its way into Senegal and Nigeria, which both have successfully halted the spread in recent weeks. 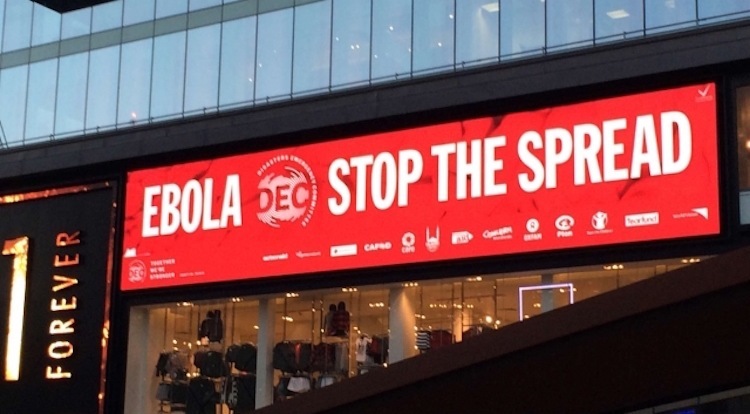 After thousands of people got infected and 5000 died of causes directly connected to Ebola, fundraisers set up numerous ways to raise money for the fight against the spread. To help stop the spread West Africa needs clean water and proper sanitation. The funds for that come from donations people make using their mobile phones and other mobile devices. In the UK the British Red Cross, UNICEF and Oxfam are running campaigns that call people to donate by mobile phone, usually the amount of a donation is no more then £5. Giro555, a Dutch fundraising organisation, has launched a full responsive website and an SMS number people can text to donate. The mobile website lets people donate amounts up to €75 (£59) using the mobile payments method Microincasso, run by mobile service provider CM. Microincasso is available in the Netherlands and Belgium and it collects the donated amount of the bank account instead of adding it to the users operator bill. Mobile phone manufacturer Ericsson is using its expertise to fight Ebola. “In a crisis like this, mobile phones empower community aid workers immediately. They can use even the most basic communications like voice and SMS, which allows them to collect information and build data”, says Elaine Weidman-Grunewald, Vice President of Sustainability and Corporate Responsibility at Ericsson. Another Dutch based organization, Text To Change (TTC), is running social campaigns in countries like Sierra Leone, Mali, Ghana, Uganda and Malawi, for awareness, social mobilization and reporting on the Ebola outbreak. “And why do we use SMS? Because 97% of SMS messages are read within 5 seconds”, Josette de Vroeg writes in a blog post. “SMS is an instantaneous, interactive and cost-effective tool to reach a great number of people quickly. Governments of the countries fighting Ebola are also seeing benefits of using mobile communications. As part of a massive public awareness effort, Senegal’s Ministry of Health sent 4 million SMS messages to the general public warning of the dangers of Ebola and how to prevent it. The messages, driven by the WHO-supported ‘mDiabetes’ platform, were targeted at people living in the capital city of Dakar and St-Louis, a heavily populated region in the country.